Its just *.sys which need to be loaded in config - 600 bytes, i tested it with Simcity and its running fine, on ATI Mach 64 it was broken - only "Chinese" characters.. on modern Nvidia too, on Vooodoo 3 i was fine, on ATI x800 too..
Hey guys - long time reader, first time poster. I've been slowly building up a machine for DOS / Windows 98 and have run into this same issue with trying to get EMM386 working for SBLive SB16 emulation. Straight after installing the SBLive software in Windows, I was getting an EMM386 warning about it unable to set the page frame. 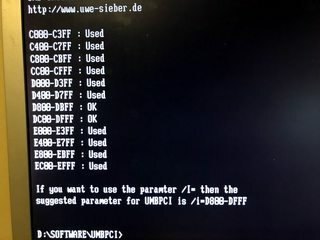 I've also tried using JEMM386 and UMBPCI.SYS but unfortunately i get the same result with the SBEINIT program. It appears to load up fine and my speakers "pop" when it does - no warnings, but no games detect the soundcard. The SBEGO utility also asks "is SB emulation enabled?". I'm really not sure what else to try and was hoping someone could lend some advice! Do you really need SB emulation in DOS? Are there any DOS games that don't work for you under Windows 98? ideasman69: You probably need to set frame EMM386 parameter to D000-D7FF. As far as i understand it, umbpci is only for Real mode (Himem only) and cant be combined with EMS / JEMM etc.. Here you can also download my autoexec + config package (search for euro text) where in config sys are comments how to set ems parameters. SB emulation is working only with EMM386 properly loaded - in EMS or NOEMS modes.. gain my autoexec and configs packages has examples. In my drivers and tools package is also tested SB Live driver.. which is working with right config branch.. Sound card type you can set at the top of autoexec to Creative.. Because of licencing, you have to copy EMM386.exe and others MS files to C:\Drivers to make it working..
https://docs.zoho.com/sheet/published.d ... 2a9209e034 // some SB live results are at the bottom, it true is that i tested only problematic games which were not working with Yamaha 744..
UMBPCI can be combined with JEMMEX, I believe. thanks guys. i actually gave up on the live yesterday with the assumption that it just wouldn't work. after reading around - it seemed that the yamaha YMF724 was a good option (due to it having a built in OPL3 chip?) Turns out i had one in the garage too! The yamaha still needs emm386 and if i have over 512MB installed, the dsdma.exe file reboots the machine. ruthan wrote: ideasman69: You probably need to set frame EMM386 parameter to D000-D7FF. I did have that set when i was testing the live card. I should've tried the I=B000-B4FF option too. ruthan wrote: As far as i understand it, umbpci is only for Real mode (Himem only) and cant be combined with EMS / JEMM etc..
dr_st wrote: Do you really need SB emulation in DOS? Are there any DOS games that don't work for you under Windows 98? well that's the thing. Even though i had no issues installing the driver, device manager was happy and the TSR was loading - there will still no sound for dos games in 98SE. Windows games were fine and i was using the VXD driver. The yamaha on the other hand has it's own issues. FM music in DOS games run in Windows 98 sound strange. It's like it's missing sections or instruments occasionally. So i've got a boot menu with MS-DOS and Windows 98 as options. The DOS option will load himem/emm386/yamaha tsr and games seem to sound as they should. ideasman69 wrote: i actually gave up on the live yesterday with the assumption that it just wouldn't work. after reading around - it seemed that the yamaha YMF724 was a good option (due to it having a built in OPL3 chip?) Turns out i had one in the garage too! The yamaha still needs emm386 and if i have over 512MB installed, the dsdma.exe file reboots the machine. Yamaha is not working without EMS too, if you trying to make machine to work, its not good ideal try more that 32 or 64 MB of ram, you can limit it for DOS by use HimemX.exe or Burnmem - both examples are in my config.sys files.. DSDMA reboots machine, at least for me, if EMM386 not properly loaded..
ideasman69 wrote: I did have that set when i was testing the live card. I should've tried the I=B000-B4FF option too. Be aware that frame= and I= are 2 different parameters, I parameters - could you give "only" more free memory, but without frame EMS is not working at all. More safe that I=B000-B4FF, should be B200-B7FF. 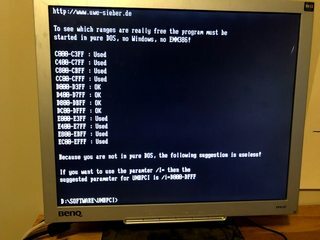 Windows 98 - personally i would avoid any DOS definitions or DOS drivers loading in Win boot branch, i usually let Windows to all things on they own..